Aside from coffee and evergreen trees, Seattle is perhaps best known for its music. And with the number of concert venues and homegrown acts, it’s easy to see why. Near Pike Place Market, catch a concert at Showbox (*1426 First Ave; showboxpresents.com), which features great mid-level national and local acts on the verge of their big break. Its sister venue, Showbox SoDo (*1700 First Ave S) tends to host slightly bigger alt-rock bands. Seattle Center (*305 Harrison St; seattlecenter.com) has multiple avenues for exploring the music scene. Here you’ll find KeyArena (keyarena.com) playing host to the biggest names in music like Ariana Grande (Mar 23). The unmistakable Museum of Pop Culture (MoPOP) (*325 Fifth Ave N; mopop.org) houses relics from rock history, including plenty from favored Seattle sons Kurt Cobain and Jimi Hendrix. For a unique experience, the new home for world-renowned radio station KEXP (472 First Ave N; kexp.org) allows visitors to watch live in-studio performances. Tours are also available weekdays from 10am to 2pm. Elsewhere, Seattle Theatre Group (stgpresents.org) runs three of the city’s beloved concert halls. 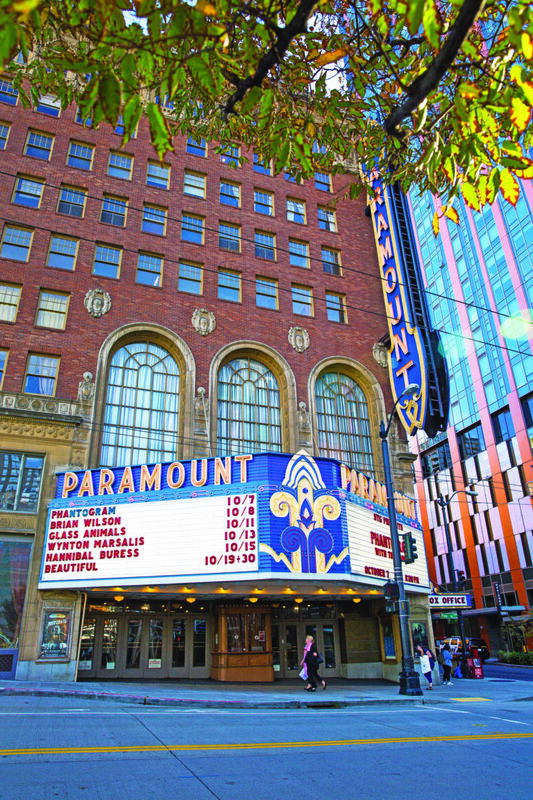 The majestic Paramount Theatre (*911 Pine St) is the go-to spot for big-time acts of the indie front. Seattle’s oldest venue, The Moore Theatre (*1932 Second Ave), is one of the top spots to see a seated show, while Neptune Theatre (1303 NE 45th St) features concerts in almost every musical genre under the sun: electronic, indie rock, punk, you name it. For a mix of rock and hip-hop offerings, make your way to Capitol Hill’s hub of concert-going, Neumos (925 E Pike St; neumos.com). Its basement venue Barboza (thebarboza.com) caters to smaller, punchier bands. If you want to jam out to a variety of acts, visit during the inaugural Upstream Music Fest (*May 11–13; upstreammusicfest.com). Featuring more than 200 artists during three days, the festival looks to become Seattle’s version of Austin’s famed South by Southwest. But no matter when you visit, Seattle is always rocking.